We made the deal on a wide section of trail, just before reaching the banks of lower Cochetopa Creek. It was our fourth week hiking the Colorado Trail from Denver to Durango, and an afternoon monsoon had just conveniently soaked the surrounding grove of old growth Aspen trees. Like a drug dealer reaching into his bag to deliver what my wife and I had been craving all day, Keith, another thru-hiker, pulled out a small plastic vial filled with a viscous, yellow liquid, and slowly unscrewed the cap. He steadily measured the agreed-upon amount and transferred it into our container, while we slowly and with great showmanship turned our palms up to reveal a buxom, freshly-cut pleurotus ostreatus mushroom. Endorphins streaming through our bloodstream, we exchanged our newly-cherished items, smiled heartily, and continued down the Colorado Trail. For our roughly 500-mile journey across Colorado, we met people from multiple states and countries: Adventure junkies, punk rockers, teachers, retired couples, and, like Keith, competent, resilient youth, out exploring the natural world. 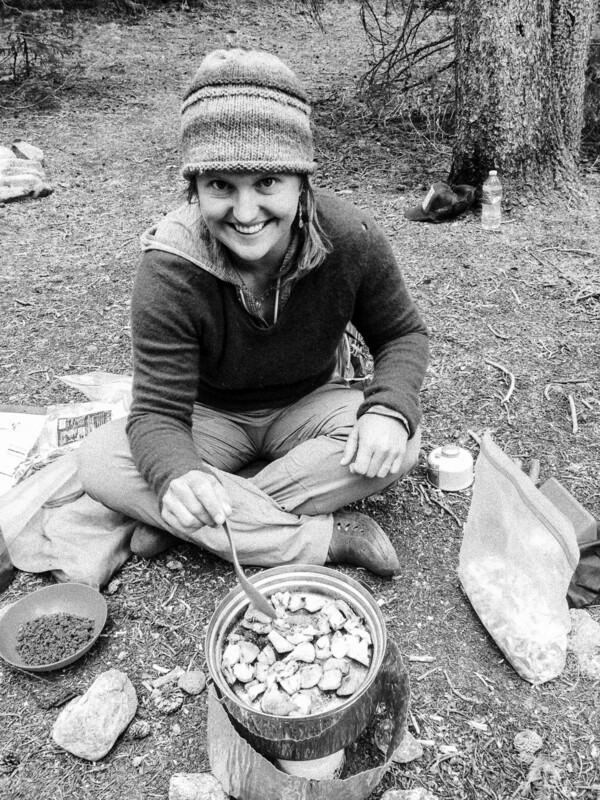 Similarly, when it came to food, eating on the Colorado Trail was as varied as its “thru-hikers,” those long-distance hikers who spend weeks (and sometimes months) walking from one end of a long trail all the way ‘thru’ to the other end. We met a couple from California who brought 20 pounds of dehydrated butter (unsurprisingly, they were the only hikers we met who hadn’t lost weight). We met a teacher from Maine who carried perfectly-weighed, calorie-counted, add-water-straight-to-the-bag Ziploc meals. We even heard that people carried tubes of cake frosting due to its great calorie to weight ratio. (Apparently, the goal of “health” manifests in myriad ways). Surprisingly, we were the only hikers, to our knowledge, who carried a small plastic bottle of whiskey, faithfully upholding cocktail hour at the end of each day. With that much hiking, you eventually learn to live with the fact that you are constantly hungry, and being hungry does strange things to your appetite. One night in Lake City, I ate an entire family-sized pizza by myself (plus two meal-like Guinness beers). I had cravings for convenience store nachos, grape soda, and frankly, anything that did not require dumping dehydrated food bits in boiling water. Through those 500 miles, the food that tasted the best and simultaneously brought us the most joy was the slightly-fishy yet covertly-lovable pleurotus ostreatus oyster mushroom. Ah…pleurotus, that pearly-white morsel of yum that has the power to make a dull backpacking meal spring back to life, and for just a moment, fool the beneficiaries into believing they are eating on a 5-star piazza overlooking the Mediterranean. After weeks of eating dehydrated food, rationing our meager pieces of chocolate, and drinking lackluster instant coffee, the pleurotus ostreatus was a treasured prize. My friend, Shan, once told me that he had heard that in Japan they don’t “hunt” mushrooms, but instead, they “catch” them. I imagine Mr. Myagi as a young boy, quietly sneaking up behind a fallen log, crouching slowly and fixated, eyeing the elusive pleurotus, leaning in, then springing forward and pouncing on the unsuspecting fungus. Eighty-five miles into the journey, just west of Kenosha Pass, walking through an aspen grove, I turned to Jenny and said, “We should keep a look out for mushrooms—oyster season is just about to start.” As if a higher power were listening in, a small pleurotus bent its fan in our direction and gave us a curt wave. We pounced. And, our once-boring ramen and freeze dried veggie dish finally found its legs. Our next encounter with the oyster mushroom occurred on the only day of our journey when, auspiciously, we didn’t see a single thru-hiker. As evening approached, we left the glorious Mt. Massive Wilderness and began looking for a campsite at the base of Mt. Elbert, which at 14,440 feet, boasts the title of “tallest mountain in Colorado.” Where other parts of Colorado have been devastated by beetle kill, we suddenly found ourselves in a forest that is still healthy and beautiful, covered in green and densely inhabited by birds and bugs singing their songs. Strolling joyfully in this newfound Eden, we spotted an old Forest Service sign that read, “Beaver Pond.” We headed off trail and found, to our supreme delight, situated in a lush mountain meadow next to a clear lake with an active beaver pond, a campsite tucked into the trees the perfect size for our tent. Having found the perfect campsite in a perfect section of woods, after a perfectly solitary walk, we decided to eat our most exciting meal for this section: A pasta dish which included a dehydrated marinara sauce made from local pork sausage and homegrown tomatoes that Jenny had meticulously prepared back in Durango. Believing that life couldn’t get much more perfect, we quickly reconsidered as a pleurotus ostreatus, ever so whimsically, twisted its gills around a downed Aspen tree, and slyly, yet assuredly, winked at us as we walked by. Like life, thru-hiking can be hard, painful, and cold. Yet, it can also be beautiful. There are times when, just for a moment, you forget about your discomforts. You sit up straight, breathe deeply, and feel grateful for the incredible opportunity of existence. For us, one of those moments took place after a long day’s walk, when we found ourselves sitting next to a mountain lake, beavers gracefully swimming by, and pleurotus ostreatus crackling in recently-acquired olive oil, our taste buds burning with anticipation. 1. Purchase or borrow a dehydrator and get started drying now. While there are surprisingly varied and abundant options for instant meals in the supermarket, they rarely contain vegetables. By planning ahead, you can buy local and seasonal produce throughout the year, dehydrate it, and keep it on hand to add to your meals. Dehydrates well: Broccoli, sweet potatoes, tomatoes, kale, fruits, herbs, and even meats and sauces. 2. Carry a small bottle of olive oil for frying mushrooms or fish you might find along the way, to add to wild salads (see next tip), and for making meals such as dehydrated hummus bearable. 3. Get to know the edible plants and mushrooms. Most of your fellow hikers will be from out of state and scared to try any wild foods, leaving an edible forest at your disposal. 4. When planning your re-supply boxes, don’t send all the food you will need. Buying a few things from the general store is a great way to tell the owner “thank you” for holding your package. Additionally, your tastes will change, and it is fun to put together unusual combinations you find in the store. Who knew Cheddar Chex Mix and acai berries would go well together? Head to the farmer´s market in late summer to gather sausage (optional), tomatoes, onions, garlic, and herbs to make your favorite marinara recipe. Cook it down, let it cool, dehydrate it (approximately 12 hours), then throw it in a food processor to grind it to a powder. On the trail, add hot water to the sauce and let it hydrate while you cook egg noodles. To your store bought instant potato spuds, add any or all of the following: dehydrated broccoli, tomatoes, chives, kale, and/or peppers (bacon bits are a nice addition, as well). Ramen noodles cook fast and don’t require draining the water (leave no trace), and basil is often plentiful in late summer. Prepare your favorite pesto recipe, but use less oil (it will be more crumbly). Dehydrate on low until dry and then pulse in the food processor to create a pesto powder. On the trail, add ramen, pesto powder, and dehydrated cherry tomatoes to a pot of boiling water. Turn off stove, let hydrate for a few minutes, top with olive oil (and sauteed mushrooms) and enjoy!